The first session of the Israeli-Palestinian peace talks began Wednesday evening in Jerusalem’s King David Hotel. Israeli Justice Minister Tzipi Livni and Palestinian chief negotiator Saeb Erekat are representing their respective sides. U.S. envoy Martin Indyk, a former U.S. ambassador to Israel, is chairing the meeting. A second working session is planned for “later this month” in the West Bank city of Jericho. In the hours leading up to Wednesday’s opening session, signs were not good for a successful conclusion to the talks. Possibly with encouragement from the U.S., Israel agreed to release a proposed 104 Palestinian prisoners currently held in its military prison. This action made it difficult for the Palestinian Authority to stay away from the talks. The release of prisoners was resisted within the Israeli public, which is still chafing over the release of 1027 Palestinian prisoners in 2011 in exchange for Gilad Shalit, an Israeli soldier held for five years by Hamas. To demonstrate that Israel was in no danger of giving away the store, Prime Minister Benjamin Netanyahu announced on the eve of the talks that the Israeli goverment would issue 2000 housing permits for construction in existing Israeli settlements on Palestinian land. Palestinian released prisoners are well aware they will not be entirely free. They remain in constant danger of being returned to prison at the slightest provocation. Releasing Palestinian prisoners is primarily symbolic – considering that Israel remains the controlling power, choosing who and when it releases and re-arresting as it pleases, whenever it pleases. At the same time it announced the names of the first prisoners to be released, Israel displayed a disdain for the talks by announcing new construction in a wide range of settlements. Something like 2,000 new units in the West Bank and East Jerusalem – some in final approval stages before building begins and others at the start of the tender process – have been announced in the last few weeks. 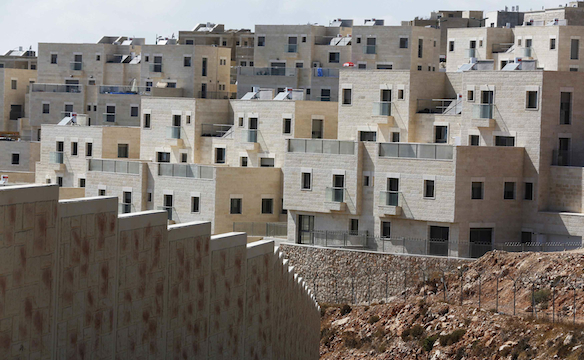 The construction published today enumerates 400 new units in Gilo, 210 in Har Homa and 183 Pisgat Ze’ev — all settlements beyond the Green Line in East Jerusalem. In the West Bank, it was made up of 117 units in Ariel, 149 in Efrat, 92 in Ma’aleh Adumim and 36 in Beitar Ilit. With details like these, it should be obvious that plans for this new settlement building were developed over a long period of time. The government’s formal announcement was timed to assuage the right-wing politicians who strongly oppose the release of Palestinian prisoners, an old political tactic of releasing good and bad news on the same day. Instead of delaying or postponing the talks, Secretary of State John Kerry gave Israel the usual diplomatic pass in spite of Israel’s arrogant and self-defeating behavior. Traveling in Colombia, according to the Reuters news service, Kerry “told reporters that while some movement on the settlement front had been expected, the wave of announcements may have been ‘outside of that level of expectation'”. This balancing act may have made sense in the narrow world of the Knesset. But, in the broader world beyond Israeli domestic politics, giving the green light to more settlement construction in contested territory is not just untimely but a fresh cause for pessimism about the prospects for successful peace negotiations. One of the main reasons Prime Minister Netanyahu agreed to the “peace talks” was to demonstrate to an increasing number of outside critics that he was willing to reach out to the Palestinians. Palestinians, Russia and the European Union (EU) on Monday slammed the Israeli approval of new settlement construction as a move aimed at “preventing” peace talks to be resumed on Wednesday. “It is clear that the Israeli government is deliberately attempting to sabotage US and international efforts to resume negotiations by approving more settlement units three days before the … Palestinian-Israeli meeting,” Palestinian negotiator Mohammed Shtayeh said. “Israeli settlements in the West Bank are illegal under international law and threaten to make a two-state solution to the Israeli-Palestinian conflict impossible,” EU foreign policy chief Catherine Ashton’s spokesman Michael Mann said. What does U.S. Secretary of State John Kerry think he’s doing? Kerry may not be Mr. Charisma, but he’s not stupid. So why has he chosen to put himself on this well-worn path to failure? No doubt it is partly because he knows unconditional U.S. support for Israel and the continued colonization of Palestinian land is deeply damaging to broader U.S. interests. No doubt he understands that current trends threaten Israel’s long-term future. . . . . .
Here’s what I think may — repeat, may — be going on and why it is still misguided. First off, even hawkish Israelis are worried about the “demographic problem,” and Prime Minister Benjamin Netanyahu’s recent warnings about the “one-state solution” reflect that concern. Serious Israelis are also worried about their eroding image worldwide, and the European Union’s largely symbolic decision to ban grants to Israeli entities on the West Bank is an important bellwether in this regard. Even a passionate advocate of “Greater Israel” — which Netanyahu surely is — might see some value in cutting a deal now, especially if he thinks he can get one that is heavily skewed in Israel’s favor. . . . . .
My fear: Even if a deal is somehow reached and the doves fly across the White House lawn nine months from now, it won’t be a true end to the conflict. If the terms are blatantly one-sided and if Israel continues to seek concessions from its far weaker Palestinian neighbors, the deal will not produce a lasting peace. Instead, it will be but a temporary respite, and conflict is likely to resume at whatever point in the future the balance of power shifts. The victors in the long conflict between Zionist Israelis and Palestinian Arabs would be wise to heed those maxims, and if I were John Kerry, I’d spend a lot of time over the next nine months reminding them about the last two. As the peace talks begin, it is important, I believe, to give John Kerry as much room to maneuver as he needs to reach his goal of a successful peace agreement in nine months. He is on a difficult assignment. He must persuade Palestinians to settle for less than they fairly deserve. And he must deal with a recalcitrant Israeli Prime Minister Netanyahu who knows he has the U.S. Congress in his hip pocket. That control of the U.S. legislative body by the leader of a foreign nation was confirmed with all of its dark implications when on May 26, 2011, Netanyahu spoke to a joint session of the U.S. Congress. Gideon Levy, a courageous Israeli columnist for Ha’aretz, wrote a column in which he told his Israeli readers, and those American readers who ought to be paying attention, just what he felt about his prime minister’s performance in his address to the U.S. Congress. It was an address with no destination, filled with lies on top of lies and illusions heaped on illusions. Only rarely is a foreign head of state invited to speak before Congress. It’s unlikely that any other has attempted to sell them such a pile of propaganda and prevarication, such hypocrisy and sanctimony as Benjamin Netanyahu did yesterday. The fact that the Congress rose to its feet multiple times to applaud him says more about the ignorance of its members than the quality of their guest’s speech. An Israeli presence on the Jordan River – cheering. Jerusalem must remain the united capital of Israel – applause. Did American’s elected representatives know that they were cheering for the death of possibility? If America loved it, we’re in big trouble. The fact that the only truth spoken in the Capitol was that of a former Israeli shouting “equal rights for Palestinians” is a badge of honor for us and a mark of shame for America. Netanyahu’s “speech of his life” was the speech of the death of peace. This is the Israeli leader about whom Levy writes, the leader with whom John Kerry must relate as he works toward an Israeli-Palestinian peace agreement. Kerry needs our prayers and our support. The way forward is dark. Godspeed, Mr. Secretary. The picture at top is from the Gilo Settlement. It appeared in Jewish journal.com. It was taken by Baz Ratner for Reuters. The posting above was updated at 1 p.m., CST, August 14. This entry was posted in John Kerry, Middle East, Middle East Politics, Netanyahu, USA. Bookmark the permalink. The problem is the grip which the Israel Lobby has on Congress and our President, — and the power they have in the American press. The government of the United States is hostage to sabotage by a government which is capable of attacking our navy, stealing our military secrets, compromising our elections, and thanklessly draining our treasury. We are being used, and so that peace talks are only a public relations gimmick. The pseudo-religious motive of Israel is a perceived duty to rebuild the temple of the Jews, and many Americans believe we are called by the Bible to help them. I am not one of those Americans. I read the Bible too. And I believe in it. The Bible does not say that the United States should help the Jews rebuild their temple so Jesus can come again, — it says nothing of the kind. Such a duty is not in the Abrahamic covenants in Genesis, not in the “70 weeks” prophecy of Daniel, not in the “dry bones” prophecy of Ezekiel, not in the prophecy on the Mount of Olives, and not in the Book of Revelation. Rather the first chapter of Isaiah tells us clearly that God wants justice, not sacrifice. God wants peace, which can be accomplished upon elements common to the Geneva Accord, the Saudi peace plan, and the Roadmap, — elements undertood to be necessary for resolution of differences by the great majority of all on both sides who have studied the problem carefully. The Bible does not say that God wants a third temple. Our problem is that we do not have an independent foreign policy in the Middle East, pursuing our enlightened national interests by a policy of friendly neutrality between responsible Arabs and Jews who would gladly make peace if we insisted upon it. And our enlightened national interests are in peace between Israel and her Arab neighbors. The Semitic peoples are a language group includings Arabs and Jews, so it cannot be anti-Semitic to want peace between Arabs and Jews. Our problem is that we take orders from from a junta in Jerusalem who do not represent the views of most American Jews who also want peace between Israel and her Arab neighbors. Our problem is that we do not follow the admonitions of George Washington on foreign policy in his farewell address. Thank you Jim, The Big Question is: Can the leopard change his spots? Will Bibi listen with his heart to people like you, Walt, Roger Cohen (Times op-ed yesterday); or will he keep pursuing the course of Israel Uber Alles? I’m not optimistic. But to invoke God speed on this process is exactly where I am. Matters of the heart spring from religious devotion. Of course “religion” has been the source of division, violence and destruction. Many of us want a relationship with the God of the universe and humankind to be the well-spring of unity without uniformity and diversity without division. It will take a miracle to turn the Israeli ship of state in a new direction. We will eventually see how serious the ruling coalition is in providing special identity for their Palestinian neighbors. Thanks, Jim. Your skill in using your own words and the words of others to describe the realities which we face in the Middle East are truly exceptional. We can argue and say that the Biblical literalists are flat wrong in their interpretations of the scriptures. However, there are probably 50 million Americans who believe that 1. God Promised the Jews the land; 2. God blesses those who bless Israel; God curses those who curse Israel; and there are probably another 50 million or more who believe that: 3. Jews coming to Israel made the desert bloom just like Europeans brought modernity to the savage and backward indigenous people in the Americas; 4. A recent Gallop poll indicated that The Palestinian Authority was rated 77% unfavorable, 15% favourable, the 5th rated unfavorability out of the 22 countries rated. ; 5. Americans aren’t big on foreign entanglements especially this one because “they’ve been fighting over land for centuries in the Middle East,” “the so-called Israeli-Palestinian conflict is intractable so why should I even bother thinking about it.” “The Israeli-Palestinian situation in no way affects my day-to-day life. Make no mistake, the affinity most Americans have for Israeli is not simply because of a powerful Israel Lobby that includes the 50 million or so Americans led by Hagee who are not Jewish. Americans are “good soil” for growing ideas that put Israel in a good light even if they fail to meet the laws of logic or empirical verification. Smith’ book traces historic themes that are deeply rooted in American culture, not simply in the Hagee followers who have an end times theology that looks nutty to most Americans. Yet, these many of these same Americans who think end times theology is nutty share a deep affinity for Israel and hold an unfavourable view of Palestinians and Muslims. The affinity that most Americans hold toward Israel is in part a result of deeply embedded ideas in American culture that have their origin in Christian Zionist thinking. How we shape our messages to advocate for peace and justice requires much more work so that our messages cut through cultural bias that is embedded in our socialization as Americans. Jim, I certainly join you in wishing John Kerry God speed, but I think our prayers need to go deeper than that. They need to be on behalf of all who are ratcheting up the pressure on the Israeli governing coalition and the US Congress, neither of which have any intent of negotiating a truly just settlement with the Palestinians. When we put teeth into our demand that Israel cease expropriating Palestinian land, expanding the settlements, I will begin to believe we’re serious about this initiative. Our condemnation of Israel’s recent announcements are brushed away like a bothersome mosquito. Unless the Palestinians get a Lobby with lots of billionaires on it to influence Congress (buy votes the way AIPAC does) then nothing good will come from the US. This new round of talks is a total sham because Israel keeps steeling more non Jewish land to build more Jews Only settlements as the talks go on. Why should the Palestinians negotiate with thieves? Christians don’t have the clout or the courage to confront Jews and Israel. Israelis are bold and focused, they know what they want and how to get it. They have the US Congress in their pocket and run the show. Let’s face it, they have all of Palestine and they did this because American Christians are either fundamentalists who support Israel or timid progressives who are afraid to speak out boldly against injustice, with a few exceptions, like Jim. But that’s not enough. Christians have acquiesced in these recent wars and in the destruction of Palestine. Without Christian billionaires as a counterweight to AIPAC, does anyone think we will ever have a voice in Congress? Jim, many thanks for the excellent roundup of views on the current situation. I do not believe that Kerry, or any other so-called “American” politician can do anything that remotely resembles justice. And any Israel wants a One-State Solution any way you look at it, but devoid of any Palestinians. Consequently, we Palestinians should start thinking out-of-the-box. Palestinians should NOT sign any deal with Israel, as long as the dramatic imbalance of power is what it is like today, and since 1948. American Middle East policy is nothing more than re-packaged “Israeli” orders, implemented by Israel’s vassals in Congress and most often, the White House itself. Without delay, Palestine should take Israel to the Criminal World Court.and hold it responsible for crimes of genocide, ethnic cleansing, expropriation of properties and lands, building settlements on Palestinian lands, prevention of refugees from returning to their homes and lands in Jerusalem and the rest of Palestine ’48 and Palestine ’67, building an apartheid wall on Palestinian lands, splitting families apart, and the list goes on. The Gulf Arabs will help replace any funds for Palestine that the US and entourage withdraw. If not forthcoming, then other countries will be happy to provide the needed funds. Palestine should demand, specifically, the lands of over 500 towns, villages, and hamlets in Palestine ’48. Israel will be required to bear the costs for destroying the towns in the first place, and the Gulf Arabs will help rebuild them. Palestine should formally demand that the UN, Interpol, the US, Russia, and EU prosecute all American and Russian citizens who have emigrated to Israel and settled in any Israeli settlements, or annexed lands, in Jerusalem and elsewhere. They should be given the choice of returning to their original countries, or Israel ’48. It is either taking this route, or going for a Two-State Solution that is built on the pre-June 1967 borders, not one inch less, and NO land swaps of deception. Israel needs to be roughly shaken out of its decadence of power. Mr. Sifri: Hear, hear! Word perfect. Justice and only justice! Viva Palestine! The Israelis won’r leave from the land they stole. They have already created one state, an apartheid state. Palestinians need to demand equal rights within one state. They need to demand it using the non violent methods used by Gandhi and Dr.Martin Luther King, Jr.
After experiencing Israel’s tactics for fifty years, both in the Middle East and in this country, this is the same old, same old. Sadly, Israel will never give full freedom to the Palestinians.